I hesitate to blog about this, but I feel I should. I received a distressing phonecall at home the other day when I was off work and shortly to attend a medical appointment. There are some sick individuals out there! He used my full name, called me “horrible and pretentious” (I hope I’m not), accused me of calling myself “Doctor” when I wasn’t a General Practitioner, then finished with “IDIOT!”, and put the phone down. Not knowing the difference between PhD and GP would be ignorance, of course. Anyone who knows me knows what a PhD is – and how hard I worked to get mine! What I find disturbing, on the other hand, is the thought that the caller must have known me to have had such a well-thought out, articulate script. To answer my greeting so sharply with what they calculated would be a suitable barb takes either a quick mind or premeditated malice. Did the caller know I would be at home that day, when normally I would be at work? (Hardly anyone did know.) Or did they just get lucky when I answered? So, is this an ignorant but quick-thinking bully, or someone who knows me – or knows of me? If the former – shame on you. Get a PhD and you, too can call yourself “Doctor” without being pretentious. If you do know me – or of me and mine – then rest assured we’ll find out who you are. 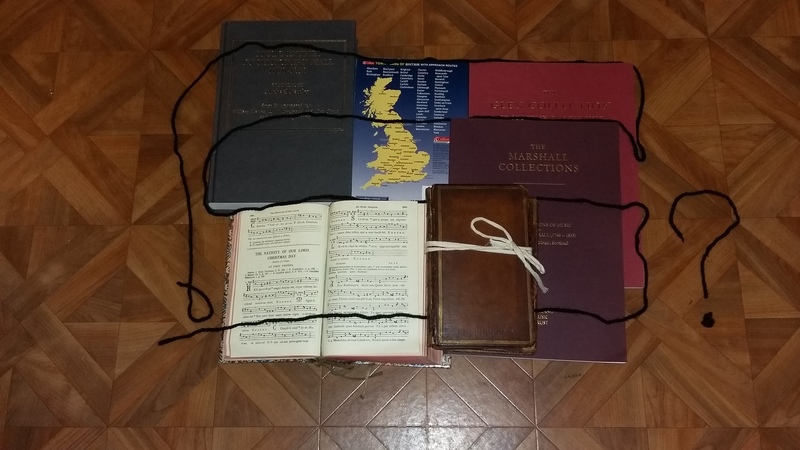 Common Threads – And Nothing to do with Sewing! Whilst I’ve been beavering away gathering information for my First Edinburgh Musical Festival talk, the realisation that my Exchange Talk will now take place before the Edinburgh one prompted me to make a start on writing the Exchange Talk first. On Tuesday evening this week, I decided to call it “Common Threads”. I pulled a few books off my shelves, arranged them tastefully if inartistically on the floor, took a batch of photos to illustrate this theme, and wrote a brief blurb about the talk itself. Today, my colleagues set to work planning publicity for it. There was just one problem. Don’t laugh. I needed a subtitle. Could I come up with one? No. I went for coffee, hoping that the creative juices would flow along with the caffeine. Still nothing. I can write readily, fluently, at the drop of a hat, but devising a subtitle that would enhance the title without pre-empting the blurb, proved harder than you’d imagine. Finally, just before lunchtime, a subtitle popped into my head, and I hastily emailed it away. Job done. Now I can get back to Edinburgh in 1815, and all will be well!